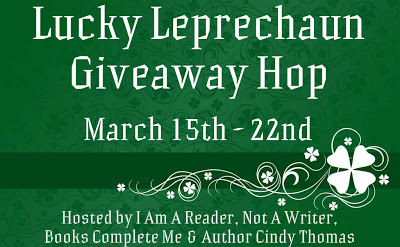 It is time for the 3rd Annual Lucky Leprechaun Giveaway Hop which is co-hosted by I Am A Reader, Not A Writer, Books Complete Me & Author Cindy Thomas. There are over 150 blogs participating in this hop so check out what they're all offering here. This hop runs from March 15th to 22nd. I always love YA cont. they're just so fairy tale romance about them (most of the time!) haha. My fav. YA cont. would have to be My Life Next Door by Huntley Fitzpatrick! I like how they usually can tie in characters we all can relate to. The girls from school, the mysterious boy in town, etc. I just began reading Dark Visions and really like it so far. I love the emotion. A favorite? Hmm, I'd say He Loves Me, He Loves You Not by Lauren Hammond. Love YA because it's REAL. I wish more good YA books had been around when I was a teenager. 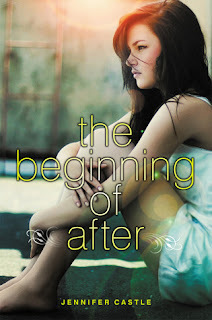 Favorite so far: If I Stay by Gayle Forman or Just Listen by Sarah Dessen. It's a nice break from the other genres as it's real. I really love 13 Little Blue Envelopes and Wanderlove. I'm older so I think I like them because they bring back memories. I also like that they seem to get to the point quickly. I have a lot of favorites but recently I'd say "Sean Griswold's Head" by Lindsey Leavitt. YA contemp usually is more fun and romantic than the other YA genres - great fast reading! I don't have a favorite, but it's always interesting reading. yes love it! so far reckless! I love the way their problems are so easy to fix. :/ I really like the Hunger Games.. though *their* problems aren't so easy. I like reading contemporary YA because I can connect better with the characters. Usually the characters have specific problems for their age and since I am going though the same things I can identify myself with them or learn a thing or two. I usually read dystopian, but it's nice to get back to reality sometimes. My favorite in this category is If I Lie by Corrine Jackson. Heartbreaking! Thanks for the giveaway! I like taking a break from world-building every now and then. And my current favorite is BRUISED by Sarah Skilton. Love the characters, first love and unique world building! Thanks for the chance to win! Its relatable and usually makes me happy. I love Before I Fall by Lauren Oliver, that book blew my mind. Contemporary is an easy read, unlike sci-fi or high fantasy. It contains a realistic stories and you'll either hate it or love it. My faves are books written by Stephanie Perkins, Cecelia Ahern, Nicholas Sparks and Colleen Hoover. And looking for more awesome contemps. My fave Genre would have to be Paranormal, I don't read much Contemporary but I wish I do. I like YA contemporary, but only the dark, "issues" books. I'm not a huge fan of contemporary romance. My favorite is probably Smack by Melvin Burgess. I love the youth emotion and it takes me back to my high school days can relate well i guess we all can in one way. I love reading everything and really enjoy the YA catagory but I don't really know if I have a favorite in the YA contemporary catagory yet. I've read quite a few within it, but I don't think I've read enough to have a favorite so I need to read more! I'm going to look at some of the ones listed above and check them out. I've actually only read a few books in the YA category, so I really don't have a favorite yet. I like the realism. It's a nice break after the vampire trend. My favorite book in the category is probably Pushing the Limits. I tend to like the darker, "issue books" of the YA contemps, not so much the lighter pure romance books. The favorite of those I've read so far would be IF I LIE by Corinne Jackson. It was gorgeous writing and there was a lot I could relate to! I have to admit that I haven't read much of this genre, but I absolutely loved Never Enough by Denise Jaden. I love to lose myself in those real stories! I love them because it's something that could really happen, no fairies, vampires or anything out of the ordinary, but that's what makes them extraordinary! My favorite is Lola and the boy next door. I have only read one contemporary book, and it was Pushing the Limits. I love dystopian and paranormal/fantasy, but it was nice to read something real for a change. I love YA Contemporary because I read books before my teen daughter does. It also is a great break because I read a lot of fantasy and paranormal. I love V is for Virgin. Thanks! I think what I really like the most is how applicable it is. It's real people, struggling through real things. The Fault in Our Stars by john green is my favorite. I love YA contemp because it is the most like real life of any other genre, in my opinion. For my kid, but back in my day I loved "The Forgotten Beasts of Eld".